Who is responsible for pedestrian safety in the UK? Of the 78 individuals surveyed, there were four (5%) clear answers of "legal", "illegal", or "don't know". These were all from councillors in various capacities. There were 31 other responses within 6 weeks. These were that someone else would be delegated to respond (13), a vague response (9), advice to ask someone else (7), a refusal to respond (1), and that the individual had left the relevant post (1). No responses were received from 43 individuals. The replies from the Prime Minister and the Deputy Prime Minister were that the Department for Transport would reply. The Department for Transport gave no clear answer, but indicated that local authorities and the police have responsibility. The National Lead on Roads Policing stated that responsibility had been transferred from the police to local authorities. There was a refusal to respond from Wirral Council, saying that the issues are beyond their legislative scope. No responses were received from the five Merseyside Police officers surveyed. No clear answers were received from the members of the House of Commons Transport Select Committee. No response was received from the Merseyside Police and Crime Commissioner except for an acknowledgement. The consensus from the four clear answers received was that footway parking is generally illegal through the prohibition on driving on footways. The first table (below) gives a summary of responses. The second table (below) details the individual responses received. Responses received to the question of "Is parking like this legal or illegal?" * "illegal: nearly always; legal: where specifically permitted"
There was one individual who had retired from the role 6 months previously, and the relevant website had not been updated. Response received to the question of "Is parking like this legal or illegal?" Mr Robert Goodwill MP Parliamentary Under Secretary of State for Transport ✔ A letter on behalf of Robert Goodwill MP suggested seeking independent legal advice, and indicated that local authorities and the police have responsibility - see letter sent on his behalf . The letter was forwarded on behalf of each of David Cameron and Nick Clegg to the Department for Transport, with no indication that the possibility of asking for a joint response from the Home Office had been considered. The official who responded on behalf of Robert Goodwill did not dispute that Robert Goodwill has (with others) responsibility for pedestrian safety, that vulnerable pedestrians are being put at risk by footway parking, that they are asking for help, and that legal clarity would assist them, but she failed to provide a clear answer. She merely provided a two-page answer that suggested seeking independent legal advice, and indicated that local authorities and the police have responsibility. They might have the responsibility for implementation of the law, but they do not have responsibility for formulating national policy. The two Home Office Ministers have some responsibility for policing policy, and so might be expected to take an interest in roads policing and pedestrian safety. The Secretary of State for Communities and Local Government is involved in local authority parking policy, and so might be expected to take an interest in how parking affects pedestrian safety. Chief Constable Suzette Davenport ACPO National Lead for Roads Policing in England and Wales ✔ "...powers were transferred from the police to local authorities...I would advise that you engage with the local authority..." See her letter . The safety of all road users is vitally important and underpins our national roads policing strategy 2011-2015 as we work to continue to reduce the numbers of persons killed and seriously injured on our roads. Reducing the risks associated with all pedestrians as road users is especially important as they are particularly vulnerable if they come into contact with moving vehicles. We live and work in busy and congested towns and cities across the UK and we are all responsible for ensuring that the available space is shared, in such a manner, as to be safe for all citizens to go about their daily business. Clearly, unlawful parking can exacerbate this situation. In 2007 parking enforcement powers were transferred from the police to local authorities, in line with each authorities statutory duty to provide road safety in their local area (s39 Road Traffic Act 1988). Therefore the responsibility for regulating the parking of vehicles on roads falls on local authorities. In addition, the Government have just concluded a consultation on parking with the aim of ensuring that parking strategies complement and enhance the attractiveness of our high streets and town centres. I would advise that you engage with the local authority in the Wirral in order to progress your campaign. Suzette Davenport's statement that the police no longer have any responsibility for parking enforcement is not correct. The Traffic Management Act 2004 allows for Civil Parking Enforcement for some contraventions (such as parking on double yellow lines)  but the offence of obstruction of the highway (including obstruction of a footway) and the offence of driving on a footway remain the responsibility of the police. If Suzette Davenport does not know the law, she cannot effectively coordinate measures to ensure pedestrian safety. Her reference to progressing "your campaign" suggests that she des not feel any responsibility for the safety of pedestrians attempting to make their way along footways. The 2013 Report of the House of Commons Transport Committee "Local authority parking enforcement" concluded that "in areas such as pavement parking, where there is a confusing patchwork approach across the country, local authorities must ensure that they communicate clearly to motorists"
So it might be expected that the members of the Committee would either know what the law is, or say that it is unclear. see Mark Smith's scanned letter here. Merseyside has the worst rates for KSI pedestrian casualties per 100,000 population so it might be expected that Merseyside Police would have a keen interest in promoting pedestrian safety. The letter to Mayor Joe Anderson asked in what circumstances footway parking is legal and in what circumstances illegal, but the response failed to give a clear answer - see scanned letter here. Ms Esther McVey MP MP for West Wirral ✔ She wrote to Wirral Council and Merseyside Police and forwarded a letter from Mark Smith (Wirral Council) in which he refused to comment. No forwarded letter from Merseyside Police received. Cllr Jeff Green Councillor for West Kirby and Thurstaston ✔ "As you are aware the Wirral West Constituency Committee had a discussion about this and have agreed to incorporate this issue into the Constituency Plan." Because the Department for Transport is best placed to respond to the matters you raise, he has asked me to forward your letter to the Department so that they may reply to your concerns directly. It is good of you to take the time to write to Mr Clegg. I hope you will understand that as the points you raise are a matter for the Department for Transport, he has asked me to forward your correspondence to them so that they may respond directly. Whilst I understand your concerns about road safety as a public health [sic], the matters you raise are not within the remit of the Department of Health. With regards to the implementation of parking restrictions, this is a matter for local authorities and you should continue to pursue your concerns with Wirral Council directly. We have noted your concerns regarding vehicles parking on footways. Mr Milliband is always grateful to hear people's views and suggestions as to how matters can be improved and believes that people such as you, who take the time to write in, provide a crucial input to the politicial process. Thank you again for taking the time to get in touch with Mr Milliband to share your views. ...as Sarah is not your MP, Parliamentary Protocol prevents her from acting on your behalf. Your Member of Parliament is Esther McVey ... You may like to contact her on this issue. Thank you for your letter to Karen Lumley MP of 27th February which she read with interest as a member of the Transport Committee. Members of Parliament are only able to correspond with their own constituents, and so should you require a response to your letter or any action taken then please address any further correspondence to your own member of Parliament who, from your address, I believe is Esther McVey MP. Whether there's a consensus or not it will be a court that ultimately determines what is or isn't legal so the [?] is one of enforcement and you should take this up with your local authority and constabulary. I have made enquiries and I have been assured that both the police and the local authorities have adequate powers to deal with all issues relating to illegal parking. As far as I am aware, unless there are specific Traffic Regulation Orders in place, or that a specific driver is witnessed causing specific damage, the Council is not formally able to take legal action. Issues such as driving onto footways or obstruction of these are matters for the Police and I understand that the Police have been in correspondence with you over this on a number of occasions over recent years. I do not consider it appropriate for the officers of the Council to comment on the legality of issues which are beyond our legislative scope and will therefore refrain from completing your survey. It is an offence to wilfully obstruct the free passage along a highway under Section 137 of the Highways Act 1980. This can be enforced immediately by Merseyside Police with a Fixed Penalty Notice. The City council can take action if damage arises from vehicles driving on the footway and this damage can be attributed to a specific road-user. Powers exist for local authorities to implement footway parking bans through Traffic Regulation Orders (TRO's); however, a city-wide footway parking ban has not been implemented in Liverpool. If there is a TRO in place on the carriageway this will normally extend to the back of footway; allowing the City Council to take enforcement action for contraventions of the TRO during times it is in force. illegal: nearly always; legal: where specifically permitted - where pavements are wide enough and have been constructed in order to facilitate such parking i.e. Dovedale Rd and Avondale Rd in Hoylake. 2. If parking on pavement was banned on both sides of many of the narrow roads in the borough, it would prevent the passage of emergency, service and HGV vehicles. 3. If parking was only to be allowed on one side of the road, it would immediately halve the parking provision in many areas - including parts of West Kirby. This would be practically, politically and democratically unacceptable to many residents. 4. In other words, we inevitably and regrettably need a compromise solution (that I have been pursuing all along) It should be clearly deemed illegal to cause OBSTRUCTION to the extent that pedestrians or permitted wheeled vehicle users (push chairs and mobility scooters etc) are forced off the pavement into the road. 5. And the Council should ALWAYS prosecute those causing damage to pavements - including the residents of properties where THEY allow workman to block or damage pavements and grass verges with their heavy vehicles. Clearly my conclusion is that parking on pavements is illegal in principle - but the practicality of enforcing it MUST take into consideration the issues outlined above. My position on all this has not changed since I first raised this parking issue in committee and at Council. The devil is in the detail of how to develop appropriate unambiguous laws - that are enforceable. Apologies for my non-reply to your survey letter. I had put it aside for a more detailed response and since your recent exchanges with David; I have just uncovered it again. Much as I would have liked to simply tick the first (illegal) box, for reasons explored in various reports including your own, I do not believe that would be correct. 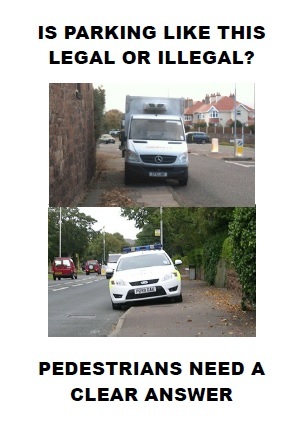 My understanding is that (regrettably) parking on the footway (apart from some specified and signed verges) is not currently illegal in Wirral; but the act of driving onto and off the footway would be an offence if witnessed by a police officer - hence your use of the second photo. It would be my wish that for reasons of pedestrian safety and costly surface repairs, parking on the footway should become just as universally unacceptable as smoking in enclosed public places has become. Those with off-street space should use it and, where possible, create more (as I have done) thus leaving on-street space for temporary visitors. Those who cannot park fully on the carriageway without causing obstruction should be obliged to park elsewhere and, if inconvenient, consider the long-term suitability of their accommodation for their vehicle usage. For the time being and to avoid significant extra expenditure by the police and council, the use of windscreen stickers and a database to record repeat 'offenders' together with an ongoing publicity campaign seems to me to be the best way of achieving the goal of 'universal unacceptability'. I strongly support David's continuing efforts to get the police and council officers to use the stickers. From the exchanges at the latest West Wirral Constituency Committee, it would appear that this has unanimous support. I hope this helps and I shall be returning the unused s.a.e.! The law is not clear. Driving on a pavement is an offence, but exactly what constitutes 'driving on a pavement' has probably not been tested. It is further confused by the decriminalisation of parking enforcement. Use of signs to indicate a local ban is a possible option for specific problem areas. Unfortunately, I am not in a position to comment on the legality of footway parking as this is a matter for each local authority to determine. Therefore, I have forwarded your letter to the Merseyside Road Safety Partnership for each local authority partner to respond directly to you so that they can explain their approach to the matter. Parking on the pavement is not, in itself, illegal. Most parking matters have been decriminalised and are now enforced by the local authority rather than the police. Local signage should indicate any restrictions which are in place. There remains the possibility for proceedings for obstructing the highway (including pavement or footpath) under the Highways Act 1980, Town Police Clauses Act 1847 and the Road Vehicles (Construction and Use) Regulations 1986, depending on the circumstances. The investigation of any alleged offences is the responsibility of the police. I hope that this letter assists you in understanding the law and our position in respect of such matters.